On behalf of U.S. Automation, it is my pleasure to introduce our comprehensive design, fabrication, programming, installation, and long-term 24-hr. support services for CNG Gas Detection and Emergency Shutdown Systems. Our advanced critical control system configurations are custom designed to meet all of the local / state building safety, fire protection codes, and emergency response requirements for each field installation. U.S. Automation has more than 10 years of professional engineering design and control system integration experience in a wide range of CNG Gas Detection Systems ranging in size from statewide bus storage/maintenance buildings for the entire network of RIPTA (Rhode Island Public Transit Authority) facilities down to very small systems consisting of single hydrogen/diesel fuel/methane gas detectors for individual battery rooms or other hazardous gas locations. Complete design, fabrication, calibration, and field commissioning of a triple-redundant CNG Gas Detection & Emergency Shutdown System for the Newport RIPTA CNG Bus Storage, Wash, and Maintenance Facility. U.S. Automation's engineering staff provided more than 80 Infrared CNG Gas Detectors and designed a fully automated emergency response/shutdown system to insure the safety of the facility buildings, the maintenance support personnel, and all of the stored buses/trolleys. This state-of-the-art CNG Gas Detection System utilizes triple redundant Triconex processors (also designed to support redundant I/O); and a full PC-based HMI system, with detailed graphic displays of the facility parameters and critical monitoring/control data. Bi-annual calibration of all installed CNG, Diesel, and Hydrogen Gas Sensors. RIPTA's multiple bus maintenance/storage facilities have gas detection units, manufactured by Detronics, Scott Instruments, General Monitors, and Thermo Electron (GasTech). Provide 24 hr. 7day per week emergency service response at any statewide RIPTA Bus Facility. Repair / Replace any defective Gas Detection System equipment, including both microprocessor based controllers, I/O cards, gas detection sensors, and defective control system software programming. Provide routine maintenance service and equipment performance tests/checks on all digital control system components. The digital control systems at RIPTA include Quantum by Detronics, Trident by Triconex, PLC 90/70 by GEFanuc, and Quadlog by Siemens (originally Moore Systems). This extensive maintenance service & emergency support contract includes a fixed-price for all routine equipment calibration, performance checks, and maintenance; but also provides pre-negotiated T&M rates for all non-scheduled/emergency field support. Complete design, fabrication, calibration, and field commissioning of a redundant CNG Gas Detection & Emergency Shutdown System for the MBTA's Cabot Bus Maintenance & Storage Facility. Our staff of experienced system engineers provided approx. 120 Infrared CNG Gas Detectors and developed a fully automated emergency response / shutdown system to insure the safety of all the facility building areas, the maintenance support personnel, and several hundred stored MBTA buses/trolleys. This high-performance CNG Gas Detection System utilizes fully redundant Siemens Quadlog processors (originally developed by Moore Systems, which is designed to support redundant I/O); and a networked Intellution iFIX system, with detailed graphic displays of all the critical facility parameters, alarm logging, trend charts, and historical monitoring/control data. It is important to mention that all of our CNG Gas Detection Systems have a state-of-the-art data monitoring utility. Our advanced data trending feature is an invaluable tool for facility operations personnel, which allows them to view individual CNG levels at each sensor over a period of one year or more. In addition, monitoring historical data is very helpful in troubleshooting CNG gas leaks, since operations personnel can recreate a dangerous situation long after a critical gas leak has been cleared. By recreating the actual environmental conditions, the facility engineers gain a better understanding of the type of gas leak (i.e. if the leak was sudden, catastrophic, or if the CNG gas level had slowly escalated over time). This important historical data also indicates if the additional ventilation provided by the exhaust fans activated by the gas monitoring system helped to bring down the CNG gas levels or if the additional emergency exhaust fans need to be installed in the facility. U.S. Automation's senior engineers were responsible for the complete PLC-based control system design/configuration & integrated data communications network architecture for a unique HVAC and environmental monitoring application to support the entire Central Artery Tunnel Project (commonly called, the Big Dig) in Boston, MA. This extensive Modicon Quantum PLC includes a large number of redundant processors providing coordinated control actions to respond to high levels of toxic fumes, tunnel fires, or limited oxygen conditions. Self-healing fiberoptic networks were utilized, as required, to maximize the overall reliability of all these critical control systems even during the worst possible operational conditions. Multiple local, color-graphic OIT's (Operator Interface Terminals) were installed in each Vent Building to provide the operator with detailed graphic displays of the key facility parameters, alarm logging, trend charts, and other critical monitoring/control data. At your request, U.S. Automation will gladly provide the detailed personnel resumes and a summary of the technical qualifications for all of our highly skilled engineering team members. In addition, to these highly skilled engineers, U.S. Automation maintains a complete staff of control system designers, ladder logic & IEC 61131 programmers, Ethernet network specialists (including wireless & fiberoptic), AutoCAD technicians, field instrumentation calibration, and other critical start-up troubleshooting experts. All of our senior project managers/ engineers are well recognized in the control system industry as experts in one or more specialized technical areas. For more than 10 years, U.S. 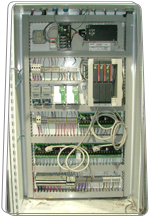 Automation has been a premier supplier of high reliability, triple/dual redundant, critical control system configurations for all of the major industrial control system manufacturers, including Triconex, GEFanuc, Siemens, Moore Systems, and numerous state-of-the-art environmental monitoring products. If you would like to discuss your specific emergency gas detection, environmental monitoring, and/or control system application; please contact us at your earliest convenience.